Hipster is a perfect personal WordPress theme for creatives who want to build their personal brand through blogging and networking – this is the modern business card. 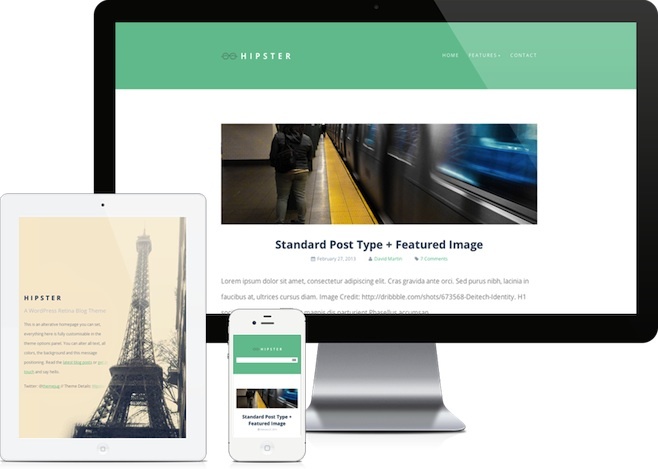 Hipster allows you to create a stylish cover page to promote yourself and the theme also boasts multiple post types that allow you to create content rich blog posts such as videos, galleries, quotes and so on. As standard, the theme is fully responsive and retina ready so it looks great on your iPad and iPhone. Features also include touch swipe support, page templates, shortcodes, retina-ready, localization support, post/page thumbnails, photo gallery, threaded comments and more.